Juan Santamaria International Airport (SJO) is the busiest airport in Costa Rica and the second busiest in all of Central America. 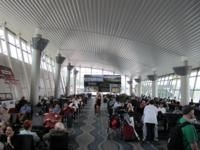 This newly renovated airport is well run and efficient at moving passengers to their destinations around the world. The airport has all the standard services including ATMs, restaurants and gift shops but expect to pay a little extra for waiting until the last minute. The airport is located 20 km from downtown San Jose in Alajuela and is on the main bus route running between the two cities. There is always a long line of taxis waiting to whisk you off to your destination while most hotels run free shuttles to and from the airport. San Jose is the main transportation hub offering access to every region of Costa Rica. Juan Santamaria International airport is also the main hub for Regional Flights throughout Costa Rica, Nicaragua, Panama and other destinations in Central America. Arriving - Here are a few tips to get you out of the airport and started on enjoying your vacation. 1. Have your paperwork filled out and ready to be presented to the immigration officials. Your airline will provide you with the necessary documents before you land in Costa Rica. Smile and be polite to the agents and you will be through the line and on to baggage claim in no time. If you are traveling with small children you will usually be allowed to utilize the Costa Rica citizens line which is much shorter. 2. Baggage claim is just down the hall from customs. When you enter the room there is a conveyor belt to your left where larger or overweight items will be unloaded and returned to you. Standard luggage will arrive on one of the few carousels. There is a liquor store where you can purchase your favor spirit cheaper than any where else in Costa Rica, a money exchange window, and an ATM. The ATM will give you the latest exchange rate where as the exchange window may not have updated its rate (today's exchange rate). Once you have collected your bags you will need to go through customs to have your bags checked out so have your declaration form ready. If your baggage does not arrive check with the airline desk in front of the carousels. 3. As you leave baggage claim you will pass through a room with a few rental car booths, another money exchange booth and the airport taxi window before heading outside. The area around the airport exit is very lively with many tour operators, taxi drivers, transfer services, hotel representatives and more, vying for your business or trying to track you down if you have a reservation. While this can be a little overwhelming i find that most people are there to work but please be careful and only accept help or services from people you feel comfortable with. *If you need taxi service, we recommend that you hire the airport taxis which are orange, they are usually better maintained than the city taxis (red). The ticket booth is on the far left as your exit the airport. 1. It is good to arrive at the airport at least 2-3 hours before your flight. 2. The first thing you will need to do is pay your airport tax (roughly $26.00) Although you can pay this at most banks or upscale hotels, the line at the airport usually moves quickly and paying it there may keep you from losing the receipt. The tax collector will give you a receipt and a form to fill out, you will need to complete it before proceeding to the ticket counter so have a pen handy. 3. Costa Rican customs is similar to other destinations except there is a special check point for families traveling with children. The process is very easy and only takes a few minutes if all your documents are valid. 4. Once you clear customs, you will have access to a few gift and souvenir shops, restaurants, bars, and a VIP room to pass the time before your flight.